Change a Bulb, Change Your World. Simple lighting changes can be one of the easiest ways to save energy and money at home. Installing efficient lighting in your home not only saves you money, it reduces waste and insures you are doing your part to use our energy resources wisely. Here are some tips to keep in mind when it comes to installing efficient lighting in your home. There are 50 bulbs in the average home. And ENERGY STAR® certified LED bulbs are on average at least 75 percent more efficient than a comparable standard bulb. They also can last up to 15x longer. That adds up to $30–$80 savings per bulb over its lifetime. ENERGY STAR certified light bulbs are independently tested to ensure they will save energy and perform well. 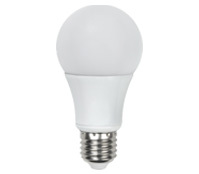 As an added bonus, NHEC offers rebates on ENERGY STAR bulbs to our residential members. SHOP IN STORE: Look for instant in-store discounts or NHSaves coupons at participating retailers. Coupons must be redeemed at the time of purchase. Minimum purchase prices and purchase limits apply. SHOP ONLINE: For instant savings on online purchases, go to www.nhsaves.com/lighting-catalog. The instant rebates are applied to qualifying products and shown in your price, and the products ship directly to you. Purchase limits apply. For rebates on LED light fixtures: Purchase a qualified ENERGY STAR certified LED light fixture and then submit for a rebate online at NHSaves.com, or by completing our mail in rebate form . Minimum purchase prices and purchase limits apply. Instant rebates may be available on certain qualifying fixture products at participating New Hampshire Home Depot store locations (online or mail-in rebate is not valid on fixtures already marked down by NHSaves at these stores). Look for products in the stores with the NHSaves special pricing label. Purchase limits apply. Learn more about making efficient lighting choices at the ENERGY STAR website or watch this video. Rebate funds are limited, available to residential members only, and the program is subject to change without notice. For more information about ENERGY STAR® lighting, please contact Patti Corbeil at corbeilp@nhec.com or 603.536.8637.